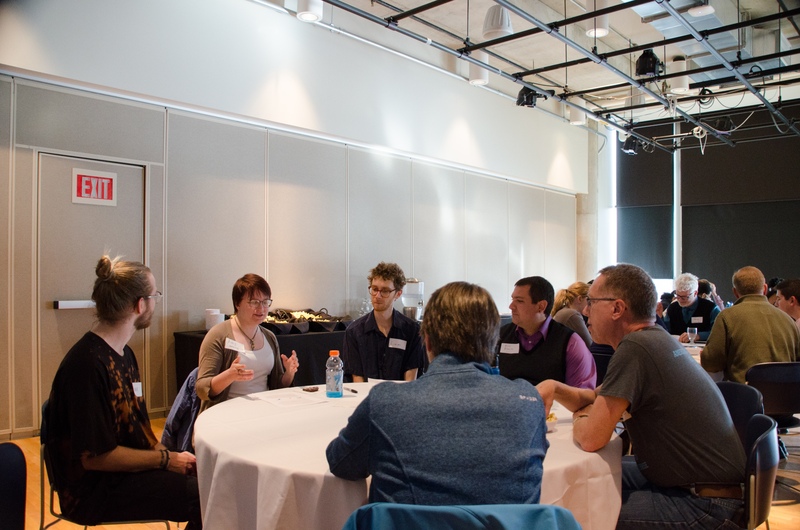 STEM faculty members and students discussed issues within their community at the summit. In order to encourage discussion among students, faculty and staff, Lawrentians Enhancing Diversity in the Sciences (LEDS) hosted a summit titled “Collaboration vs. Competition.” This summit was held in the Esch Hurvis room of the Warch Campus Center at 5 p.m. on Tuesday, Apr. 9. This event included discussions and data interpretation from recent surveys, specifically the 2018 Campus Climate Survey as well as the latest Student Welfare Committee Survey. The major takeaway of the campus climate survey was that 34.3 percent of the students who filled out the survey did not feel emotionally supported at Lawrence. The Student Welfare Committee Survey dealt with issues centered around the “busyness Olympic issue,” as it was referred to at the summit. Questions were relevant to competition, group work and learning styles. According to student leaders of LEDS, “Busyness Olympics does not care about major. It affects all of us, our mental health and ultimately our happiness.” Approximately 110 students filled out the survey, which is roughly 10 percent of the student population. Although the results showed that many Lawrentians are truly interested in learning, more than 50 percent of the students who took the survey said they view Lawrence as a competitive community. In addition to this feeling of competition, more than 50 percent felt external and internal pressure to be busy all the time. In terms of learning styles, the survey revealed that many Lawrence students do value a collaborative learning environment, but most of the students actually prefer to work alone. The results also showed that professors motivate many students to learn. Despite the smaller percentage of people who reported feeling marginalized at some point in the classroom, leaders of LEDS stated that this number should be much smaller and preferably zero. With this information in mind, tables were encouraged to participate in open and honest dialogue in response to the prompts given to their respective group facilitator. Groups were then given approximately 20 minutes to discuss each prompt before moving on and eventually joining all together as a larger group once again. These topics lead to discussions across tables about how students, faculty and staff can respond to these results. Some participants mentioned the small nature of campus and the residential atmosphere, which could potentially be amplifying the competition by having students so near each other. Others discussed alternative grading and teaching methods as well as group collaboration efforts. The “AP Culture” that comes from many high schools and graduate school preparation were contributed as stressors that evoke competition amongst students. To learn more about LEDS, members of the Lawrence community can attend the group’s meetings at 5 p.m. in Sabin House. Meetings are open to students, staff and faculty to foster dialogue with respect to different perspectives. LEDS is also hosting a community conversation, “Let’s Talk About Time,” that will occur at various times throughout the week of Apr. 15. On Monday, Apr. 15, and Thursday, Apr. 18, the conversation will be held at 4 p.m. in the Sabin House living room. On Tuesday, Apr. 16, the talk will occur at 7 p.m. in the Meade Witter Room of Warch Campus Center. The final opportunity to participate in the community conversation is on Friday, Apr. 19, at noon in Harper Hall.